We were shown a statistic saying nearly one third of all aircraft accidents at night end in fatality, as opposed to just 13.8% of accidents during the day. And why is that? Recently, a friend and I attended our first AOPA Air Safety Institute (ASI) Seminar on night flying, and I left with a very cool hat, so I believe you can consider the event a success. All jokes aside, the ASI Seminar on “Fly By Night,” hosted by Wayne Phillips of Flight Training Magazine’s “Career Pilot” article series, was incredibly informative, and taught both pilots with thousands of hours, and student pilots like myself lots of surprising and interesting tips and tricks for remaining safe while night flying. 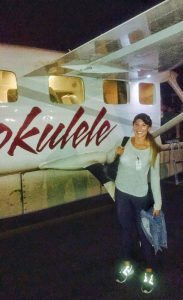 My partner in crime of the evening was MacKenzie, a commercial pilot all of 24 years old who just returned to her hometown of Reno, NV after flying a Cessna 208 Caravan in Hawaii. 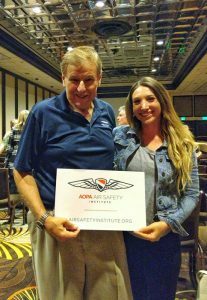 She recently joined the High Sierra Pilots flying club, founded by Disciples of Flight founder Bryan Stewart, to pursue flight training for her CFI. We’re hoping she sticks around and teaches for our club, based at KMEV in Minden, NV. We were actually scheduled to go on a night flight that same evening with my instructor Russ Smith into KRNO, but he canceled and recommended we go to the seminar, held at the Atlantis Casino Resort in Reno. So we figured, hey, what the heck, and decided to meet there. MacKenzie with a Cessna Caravan in Hawaii at night. The audience preparing for the seminar to begin. We laughed and found our seats, getting comfortable as Wayne set up the presentation up front. Wayne then had us raise our hands if we were student pilots, private pilots (VFR only), IFR pilots, and so on until he came to CFIs. “And how many fright inflictors– flight instructors, sorry- do we have in the house today?” A few hands went up, but plenty of laughs were heard. When he asked about DPEs and no hands went up, a pilot in the audience hollered, “They’re all at the bar!” Suffice to say, seams were split. After having us introduce ourselves to others in the audience, we lept into the topic at hand: night flying. Flying at night tends to offer better performance, lower collision risk, smoother air, less traffic, and not to mention some pretty extraordinary views- but at what cost? Wayne showed us a statistic saying nearly one-third of all aircraft accidents at night end in fatality, as opposed to just 13.8% of accidents during the day. And why is that? It turns out there are a whole plethora of causes, the simplest being, “Well, it’s dark outside.” It’s easier to get disoriented at night, terrain becomes all but invisible, problems and stressful situations seem amplified, and as diurnal creatures, we are less focused, require more oxygen, and have to adapt to the darkness by utilizing off-center viewing and staying far, far away from bright white lights. Murmurs of the audience seem to suggest both yes and no, to which Wayne responded, “No one likes more regulations, and safety can’t be regulated completely all of the time.” He suggests we self-regulate by proposing personal minimums (he prefers a 5 SM minimum visibility at night, as opposed to the legal 3 SM) and that we treat night VFR as IMC in practice. Wayne continued that thought by suggesting that we VFR pilots practice attitude/instrument flying much more frequently than many of us do in preparation for night flying, and familiarize ourselves with IFR charts and publications… but we’ll get to that later. 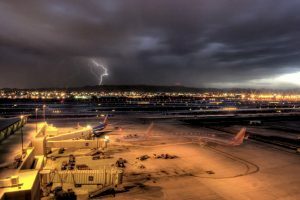 A brief video case study of an accident advises that we should pay extra attention to weather at night, and take steps to eliminate the risk of becoming “mesmerized by night views,” by improving our general situational awareness. Sometimes, it seems, we as pilots become fixated on the unique risks of flying at night that we forget to focus on the “every day” parts of flying, like weight and balance and fuel levels. As we all know, the VFR fuel minimums increase from 30 minutes excess to 45 minutes excess at night, but Wayne had a personal story to imply there’s more to it than that. As a young man, Wayne took three passengers (a double date; two women and another man about Wayne’s size, just over 6’ or so) to dinner in his Piper Warrior. After landing at their destination, Wayne unthinkingly told the line guy to “fill ‘er up,” eliciting groans from the audience of experienced pilots. Anyone familiar with the Warrior (or any small, 4 seat GA aircraft, really) can see the issue here. Surprisingly, the powerful little Warrior got everyone off the runway and home safe, but Wayne admits that thinking back on the mistakes he’s made in his youth that he’s very happy to be alive. The moral of the story is: don’t become so fixated on the uniqueness of night flying that you fall prey to the regular dangers of everyday flying. Single Engine Pistons Singled Out? The reason behind my bias toward SE pistons: Piper Cherokee 4566R, aka, the love of my life. 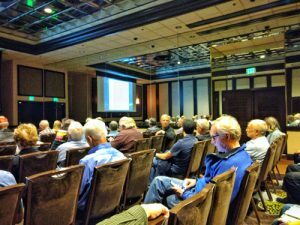 The presentation (prepared by AOPA, not Wayne himself) then asks if single engine pistons are not a “good idea” for night flying, which filled me with no small amount of indignation and caused me to angrily scrawl, “SE pistons always a good idea! !” in my notebook. Forcing myself to push personal opinions aside still can’t sway me from the mindset that all airplanes are just as safe as their pilot (unless, I suppose, it’s a kit plane you built in your basement primarily with duct tape and dreams). Safety is minimizing risk to an acceptable level, Wayne says, implying that “safe” is a unique experience for each pilot. 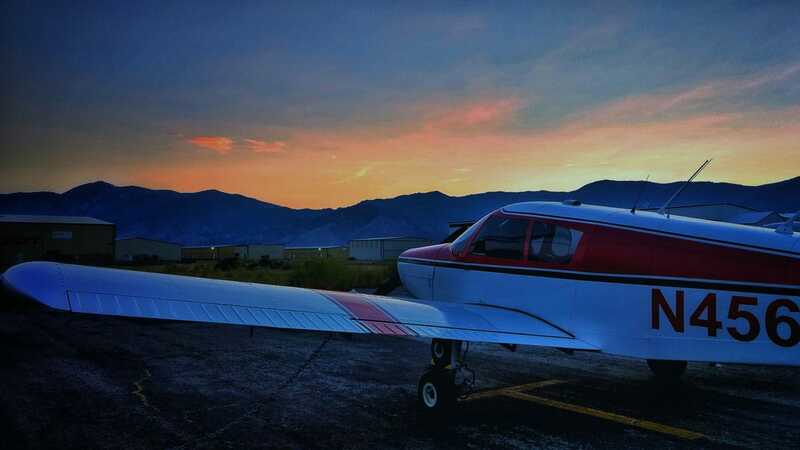 Nevertheless, when flying VFR at night, regardless of skill level or experience, Wayne suggests it’s wise to use IFR charts and minimums to navigate terrain and obstructions safely. For VFR pilots and student pilots like myself who have a limited-at-best knowledge of IFR charts, remember these acronyms: MEA, MOCA, MVA, ODP. Most, if not all, of the following charts, can be found online for free, and can definitely be found in all applicable chart supplements and EFB’s like ForeFlight. The MEA, or minimum en route IFR altitude chart (which seems to me to be missing quite a few letters in its acronym), can be used to advise VFR pilots of the lowest safe altitude you can fly that meets obstacle clearance requirements and ensures radio coverage. The MOCA, or minimum obstacle clearance altitude, is especially useful for VFR pilots flying at night over either metropolitan or mountainous terrain, because these charts will place you at least 1,000 ft over the highest obstacle in flat land, and 2,000 ft over the highest obstacle in high elevation mountainous terrain. MVAs, or minimum vectoring altitudes, are the lowest altitudes a controller can clear you to fly during vectoring and direct routing. Like MOCAs, MVAs will place you 1,000 ft above the obstacle in flat lands or 2,000 ft above the obstacle in mountains, but it will also place you at least 3SM horizontally from the obstacle as well. ODPs, or obstacle departure procedures, keep IFR aircraft clear of obstructions during climb out. These are especially important in non-radar environments and without the assistance of ATC, or if you fly in and out of areas like KTRK where you’re surrounded by gigantic mountains and gigantic trees in every direction. If you are flying VFR at night, Wayne strongly recommends using flight following and requesting MSAW, or minimum safe altitude warnings, ensuring you will be kept both out of the path of other traffic, and out of the trees. A tragic case study provided tells the story of a Rockwell Commander and its 6 occupants dying after flying straight into a mountain outside of Phoenix, Arizona. The pilot had never flown that path at night but had flown it many times during the day. He didn’t request flight following and stayed lower than he should have to avoid flying through Class B airspace. Unfortunately, a simple MSAW could have saved his life and the lives of his children and passengers. After the laughter died down, Wayne goes on to say that this is incredibly unlikely and you’ll probably never have any issues with ATC clearances, especially at night when there’s typically less traffic to worry about. I glanced around. No hands went up. Wayne looked a little surprised before saying in a dramatic, action-movie voice, “We have real pilots here in Nevada.” Everyone cracked up at their own expense, enjoying the solidarity of a community of pilots influenced by the macho attitude of the “last bastion of the Wild, Wild West,” as I like to call it. Wayne then recalled a story where he was approaching to land at a small airport late at night, his parents waiting there to pick him up. AWOS reported winds from 310 at 4. Wayne experienced something a little more along the lines of winds from 150 at 27, nearly a direct and very strong crosswind to the airports only runway. After executing a “humongous crab” nearly to the ground, he bailed out and went to another nearby airport with more runway options, much to the displeasure of his already put-out parents. Another weather-related “character building experience” Wayne recalled was being vectored through two thunderstorms at night. Departing the airport, Wayne experienced beautiful, smooth air, and a fantastic lightshow ahead where lightning was reenacting the finale of a fireworks show. ATC comes on, asking, “We have two cells ahead, one at 11’o’clock and the other at 1’o’clock. We can vector you between them or around if you want to go to [some other airport].” Being a young man, Wayne came back requesting to be vectored between the storms. This is how Wayne learned that it’s very difficult to see clouds at night. Suddenly the stars disappeared, there was a loud BANG, and Wayne was nearly inverted. Spatial disorientation be damned, Wayne recovered the airplane and made it safely to his destination. 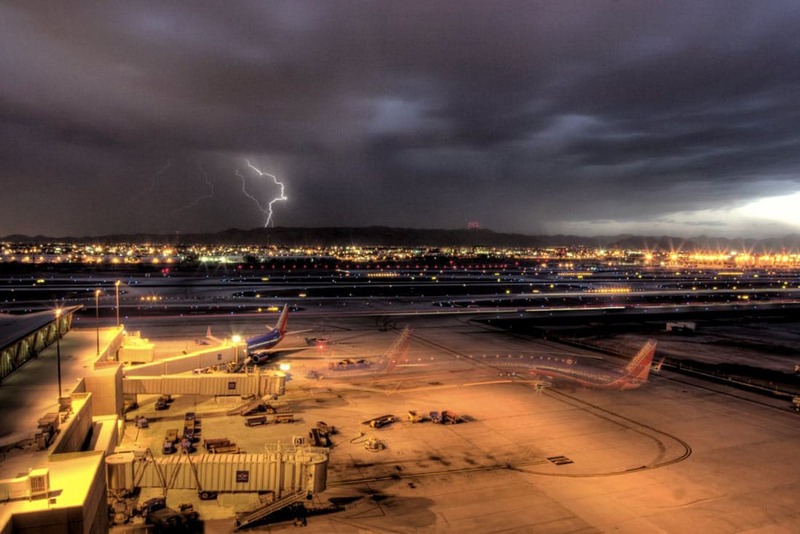 This is not often the case, particularly when flying through weather at night. This anecdote segued into the tragic and history-making death of John F. Kennedy Jr., which, Wayne was surprised to say, was not actually included in the provided presentation, so he added it in himself. Because the article is so excellent, I suggest you read it yourself: “10 Mistakes JFK Jr. Made,” written over 10 years after the accident. What does it mean if the runway edge lights are blinking intermittently? Suicidal deer! To remind yourself to close your flight plan, put your watch on the other wrist. Be especially aware of icing conditions at night, because you’ll like have no visual warning before you experience engine roughness or loss of power. Never doubt the power of pilotage. Check Google Earth along with your flight planning resources to check terrain. Be wary of LED lights in the cockpit when flying at night, but always bring a backup flashlight and batteries. Wayne Phillips and MacKenzie after the seminar. To bring the evening to a close, Wayne called me up to the front to be the Vanna to his Pat and pick names out of a champagne bucket to hand out prizes to the audience. The first winner was another female pilot (woo!) who claimed the “Hoodie,” a new incarnation of “foggles.” The second was a man who won a hat and immediately gave it back to Wayne, who then gave it to me (double woo!). The third and final winner was an older lady who won the other bright orange ASI hat. All in all, my first ASI seminar was hilarious and very helpful, prompting me to begin studying for my instrument rating now so that I can become a safer pilot and make the most out of my private pilot privileges, even just flying VFR. If you want to find an ASI seminar near you, click here! Have a Blast at Your Next BFR – Add a Seaplane Rating! I’ve been a VFR pilot for 30 years. I used to love night flying my single. Then I had an engine failure with my family on board. The caused was f.o.d from the intake plenum–a known problem with an A.D that was scrupulously complied with. It’s funny to joke about turning the landing light off if you don’t like what you see when you have an engine failure at night, but that experience caused me to change my personal minimums in several respects, one of which is giving up night flight with passengers. It is both limiting and disappointing, but I don’t trust the machine as much as I used to. BTW, I’ve always been the sole owner and only pilot of my planes, and I partcipate in maintenance, do oil analysis etc.